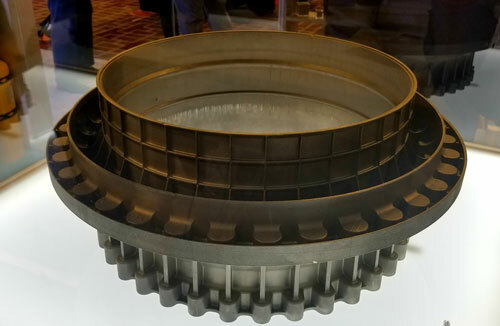 At AMUG 2019,GE Additive displayed this prototype of a ULA Vulcan Centaur rocket part, a bellows housing. The AM prototype reduced weight by 60 percent and lead time by half. When the Vulcan Centaur rocket from United Launch Alliance lifts off in 2021, soaring with it will be the fruits of GE Additive’s Project A.T.L.A.S. (Additive Technology Large Area System). As displayed at AMUG 2019 in Chicago, IL, a bellows feedline housing produced via the Project A.T.L.A.S. weighs in at less than 70 lb., 60 percent less than the original forged and machined part—1000-lb.-plus Inconel 718 alloy milled down to 173 lb. Project A.T.L.A.S. represents GE Additive’s program to develop the next generation of large additive manufacturing (AM) machines. The company developed this beta machine, which reportedly offers the world’s largest direct metal laser melting (DMLM) build envelope, in only 9 mo. The ‘meter-class’ laser powder bed fusion machine showcases several key technologies, including scalable architecture, combined with feature resolution and build-rate speeds surpassing today’s machines, according to GE Additive officials. Select customers, report company officials, currently operate beta machines to gain early appreciation of their current capabilities and long-term potential, and to provide learning and experience feedback to enhance future machine configurations. The beta build envelope measures 950 by 810 by 300 mm (scalable). Machine attributes as reported by GE Additive include gantry-based architecture, use of as many as four 1.5-kW lasers, state-of-the-art scanner with 3D focusing, discrete material dosing, optimal air-flow control over the print area, high feature resolution, and process and machine health monitoring courtesy of GE’s Predix software. In rocketry, bellows expansion joints (named for ridges in the joints that look like fireplace bellows) can flex as engines adjust, or gimbal, to control direction of thrust. These joints connect fuel and oxidizer lines to the engines. The housing, like other parts required for the new rocket, presented lead-time challenges. Produced in its original manner as a machined part, the housing had a typical lead time of 9 to 12 mo. Given that production of this part began with a half-ton solid-metal block, handling and transport during manufacturing also presented logistical and safety challenges. The ULA engineering team, researching AM possibilities in rocket-part production, felt that leveraging the technology could reduce greatly not only lead time but overall part weight. Of course, weight reduction is of paramount consideration in space flight. ULA approached GE Additive about printing the housing on the recently developed Project A.T.L.A.S. Convinced that the new machine could handle such a manufacturing challenge, the ULA design team provided the initial design. From there, GE Additive’s AddWorks team, parlaying experience gained in the company’s own AM efforts, helped provide design and support strategies to ensure successful printing. AddWorks imbeds GE Additive experts with a customer’s team, learning about the customer’s current products and how they can be optimized and produced more efficiently. AddWorks assessments help determine if a part is appropriate for additive, or would be better produced via conventional means. Services include disruptive design, materials development, product development and prototyping, part and machine qualification, and more. The process, and the resulting DMLM prototype part, formerly 9 to 12 mo. from order to delivery, was delivered in less than 6 mo. using AM. The project also provides data to help improve production of other Vulcan Centaur components, according to ULA officials.